The jit.brass object does a quick and dirty embossing effect on an 4-plane char input matrix. 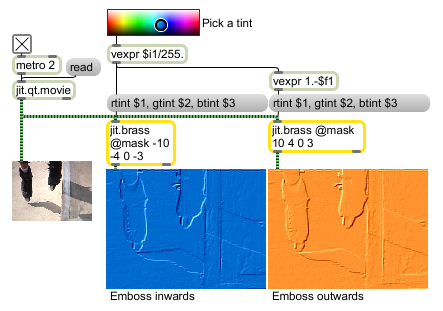 You can specify the amount and direction of the emboss effect and apply an overall tint to the output matrix. The numbers in the list control the embossing amount for the four axes around each cell in the form upperleft-to-lowerright top-to-bottom upperright-to-lowerleft across-the-middle . Negative values will invert the direction of the effect.